It’s Friday and time think about getting together and planning some rides for the warmer months ahead. Here in this photo, Here in this photo HaveFunBiking George will soon melt away as the spring thaw approaches, Maybe its time to start planning your #NextBikeAdventure? 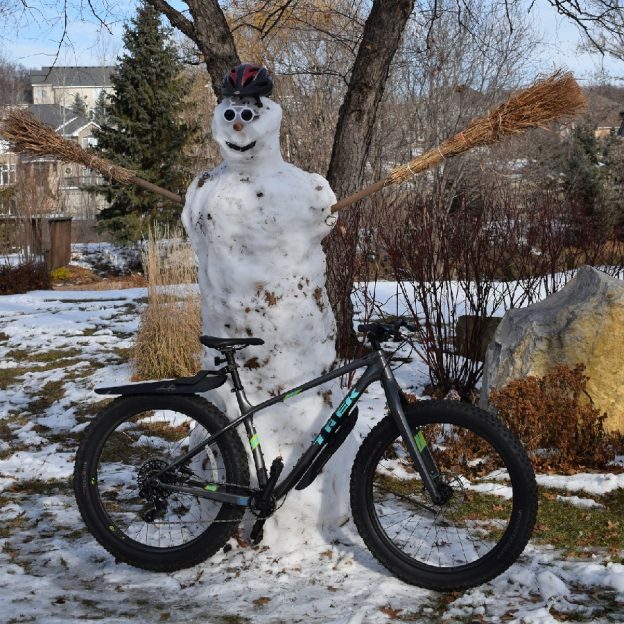 This entry was posted in Picture of the Day and tagged bicycle lifestyle, bike minnesota, biker dude, Fat Bike Fun, melting snowman, Minnesota Mountain Bike Trails, Minnesota Off-Road Cyclists, Minnesota trails, MORC, mountain bike fun, Mountain Biking, spring thaw, sunglasses, yeah Friday on March 16, 2018 by Russ Lowthian. 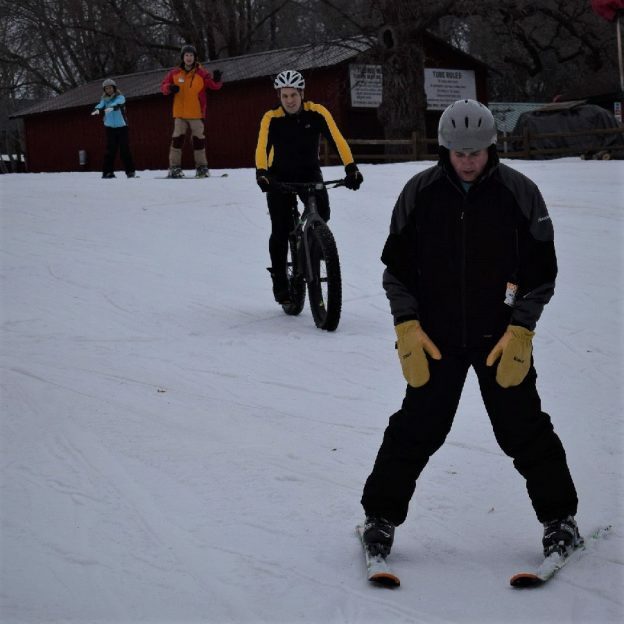 The first annual Snow Bowl Fat Bike Race conquers Ham Lake! 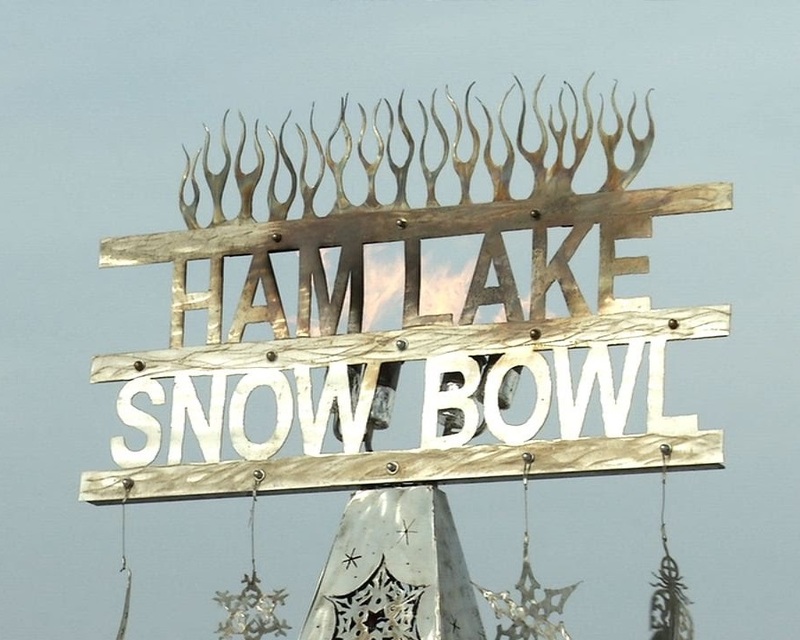 Along with a new fat tire race, the 12th Annual Ham Lake Snowbowl takes place February 10th offering fun things to see and do for the whole family. Ham Lake is located in the Twin Cities Gateway Area on the north side of Minneapolis and St Paul and looks forward to your visit. 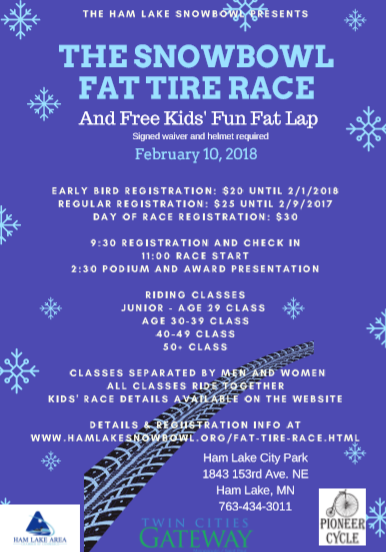 They are teaming up with the racing crew at the the National Sports Center Velodrome, in Blaine, to create a this fat bike race as part of the Ham Lake SnowBowl festivities. The course will wind through Ham Lake Park, on trails, through scenic woods areas and on the open lake area (If frozen of course). There will be elevation changes and some obstacles easily negotiable by all racers. – All classes will ride together but will be scored separately. Medals will be awarded to the Top 3 in each age and gender class. -Ice Fishing Contest on Ham Lake—sponsored by the Three Rivers District Order of the Arrow. -Snow Sculpture Contest—featuring sculptors from all over the country, and even the world! Vote for your favorite. -Broomball Tournament—bringing local teams together as well as those from surrounding states. -Guess the Snow Sculpture Break-Through Date & Time and win cash! -Follow clues to find the Snowbowl Medallion and win cash! -Dog pull…Business Expo…Craft Extravaganza…Sledding Hill…Silent Auction…Pull Tabs…Food and more! So winter or summer, come and discovering the amenities in Ham Lake for your #nextbikeadventure in the Twin Cities Gateway. 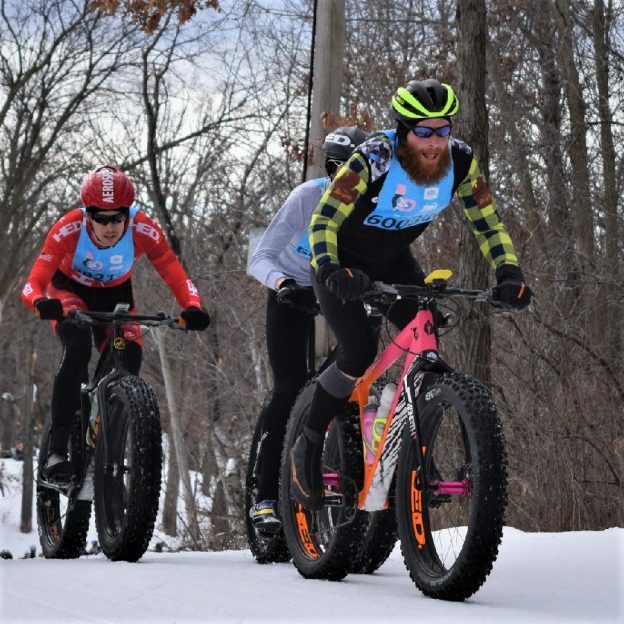 This entry was posted in News and tagged Fat Bike Fun, Fat Bike Race, Ham Lake MN, Ham Lake Park, Ham Lake Snow Bowl, National Sports Center Velodrome, Pioneer Cycle, Snow Bowl Fat Bike Race, Twin Cities Gateway on January 19, 2018 by Russ Lowthian. 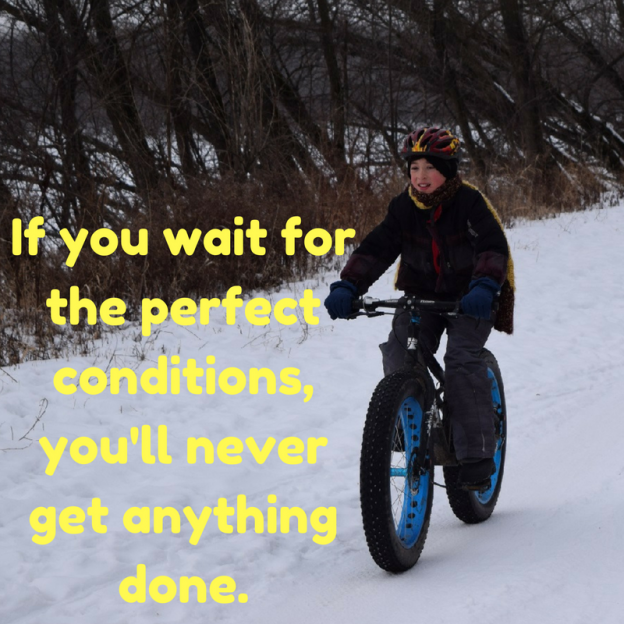 “If you wait for perfect conditions, you’ll never get anything done.” A little Monday winter wisdom to get you through the rest of your week. Just because Winter is upon us, doesn’t mean it’s time to hang up your helmets. View all the fun ideas and bike destinations in our new HaveFunBiking Guide. Then plan your next outing with family and friends at one of the HaveFunBiking Destinations. 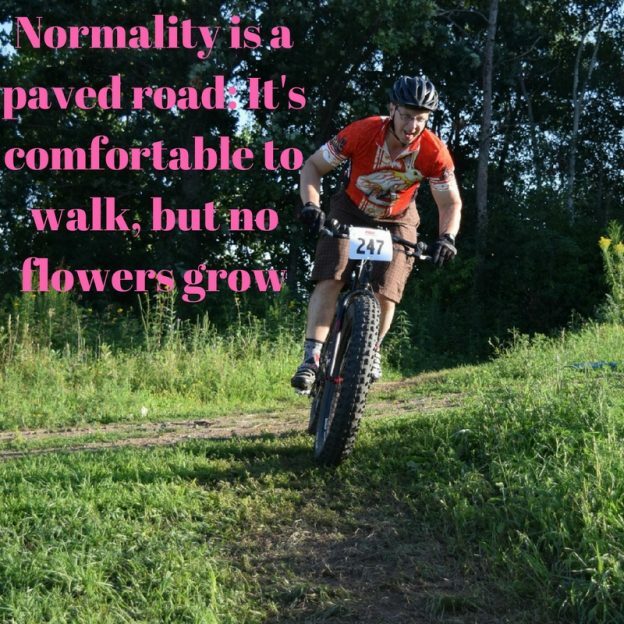 This entry was posted in News and tagged bike, Bike Iowa, bike minnesota, Brainerd MN, fat bike, Fat Bike Fun, free bike maps, fun, fun bike events, Minnesota trails, Monday winter wisdom, Monday wisdom, MORC, next bike adventure, Winter Biking on January 7, 2018 by Russ Lowthian. 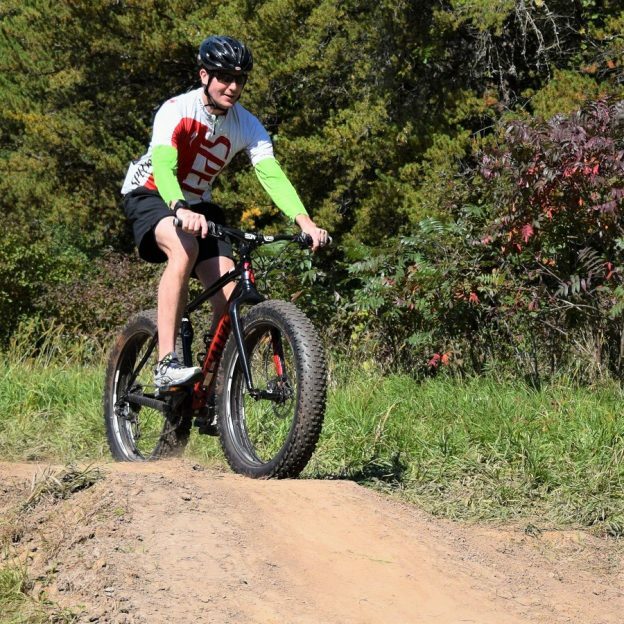 The magic begins as this new fat biker discovers the fun of riding the trail on a fatty. If you haven’t tried a fat bike yet, visit your local bike shop and take one out for a test ride. 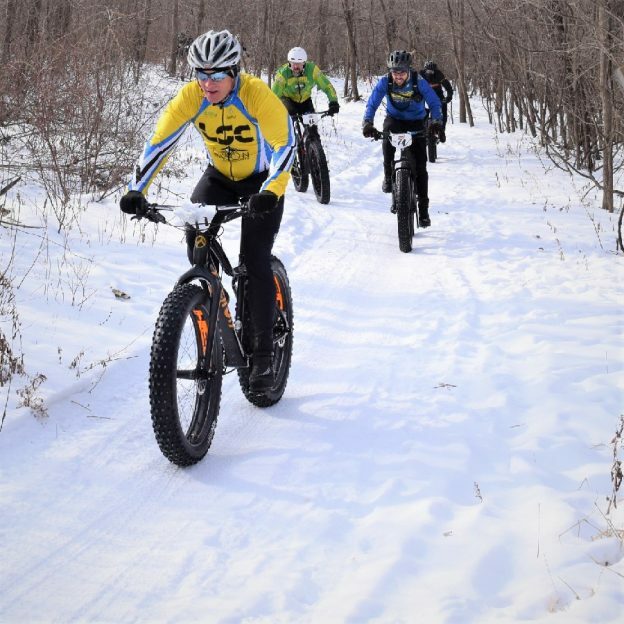 As many upper Midwest bike riders now are changing their gear over to winter activities, including fat biking, ice fishing, skiing, snowshoeing and other cold weather sports, see all the places to explore in the new Minnesota Bike/Hike Guide. 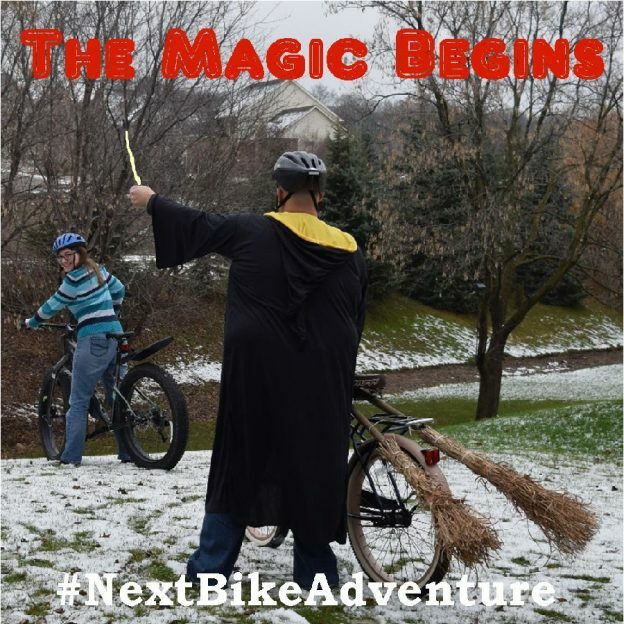 This entry was posted in News, Picture of the Day and tagged #bicycle, #fatbike, #gryffindor, #harrypotter, #next adventure, #nextbikeadventure, #nimbus, #sharethemagic, #smallbusinesssaturday, #wizardingworld, #wizardingworldofharrypotter, apparate, bike, bike magic, fat bike, Fat Bike Fun, Minnesota trails, transfiguration on December 28, 2017 by Russ Lowthian. “Normality is a paved road: It’s comfortable to walk, but no flowers grow” -Vincent van Gogh. Being on the pavement might be more comfortable but exploring outside of it can be beautiful. 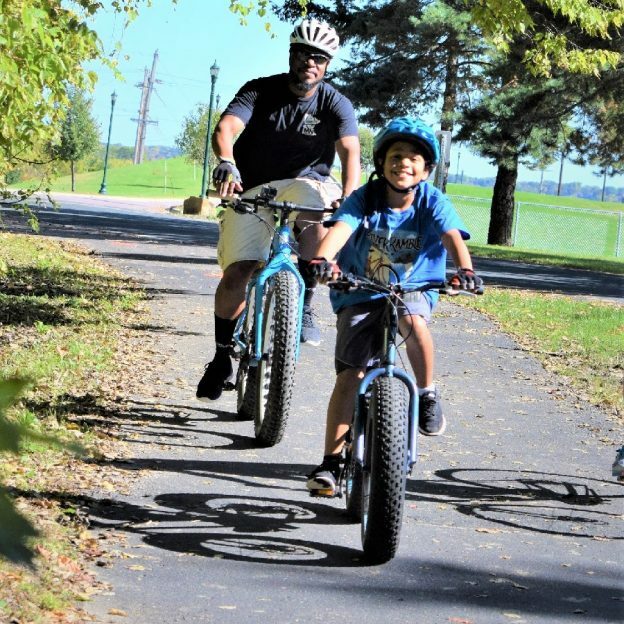 While you wait for it to warm up, grab a Minnesota Bike Guide and find a little piece of serenity planning your #NextBikeAdventure! This entry was posted in News, Picture of the Day and tagged #bicycle, #mountainbiking, #nextadventure, #nextbikeadventure, #onlyinMN, #picofday, #visitLakeville #penncycle, Bike Guide Minnesota, Bike Guide MN, Fat Bike Fun, Lakeville MN, Minnesota, Minnesota Bike Guide, MN Bike Guide on January 25, 2017 by Stephanie Hunt.